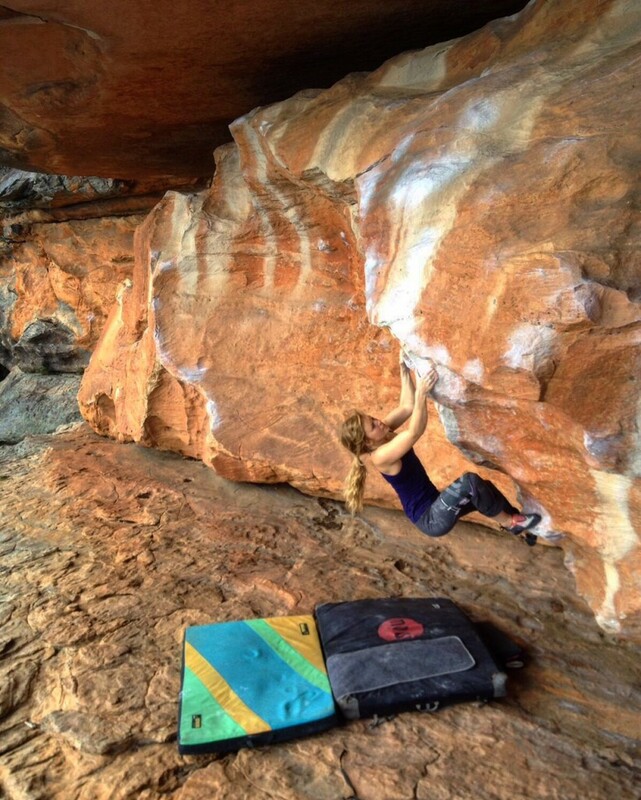 Going to Australia was always going to be more than just a climbing trip. I mean, they have kangaroos for goodness sake. To me, that’s the stuff of cartoons: childhood, Disney-esque images coming to life. 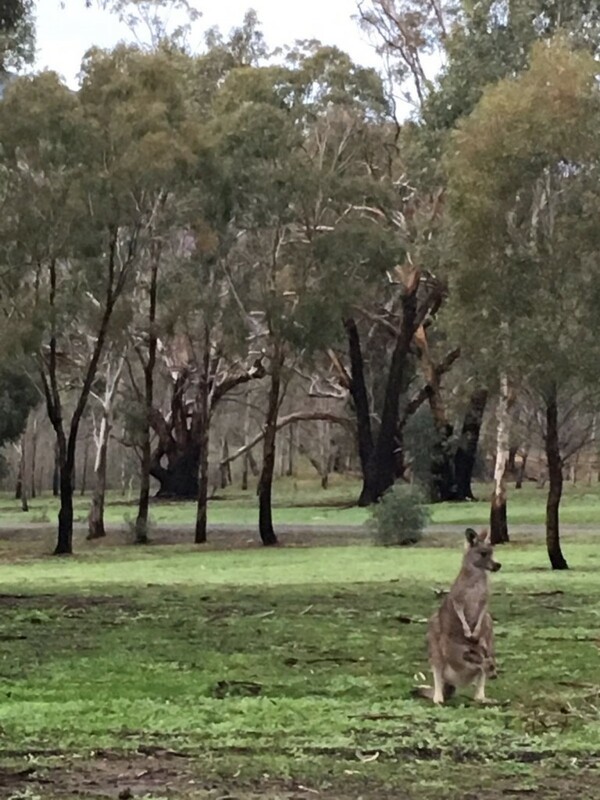 It was a shock to find out that, as a species, the kangaroos seem pretty suicidal. Driving in the Grampians can be pretty terrifying due to their inability to move backwards (rendering retreat pretty impossible) and seemingly distinct lack of desire to live. But still, they have built in pouches to carry their babies and, apparently, they can actually halt a pregnancy if conditions to give birth aren’t right. That’s ridiculous, enough said. 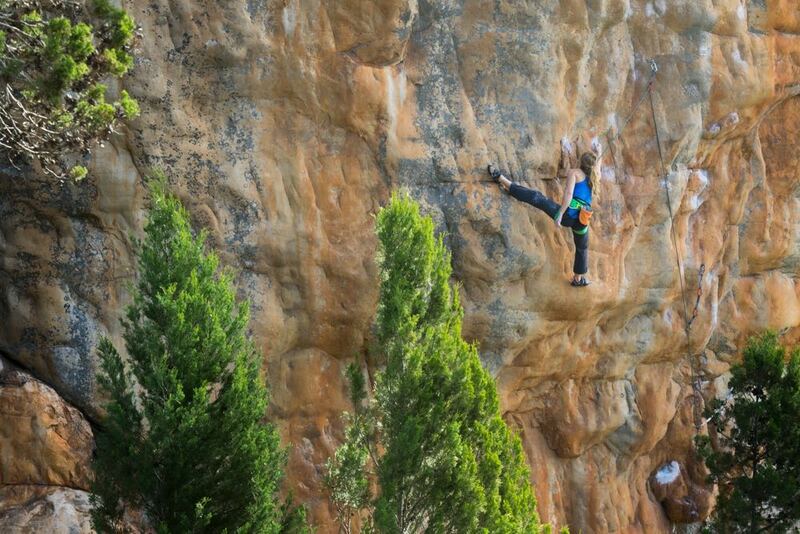 So, now that the excitement about kangaroos is done, let’s chat climbing. We settled in Wartook for our stay, a small cabin at the “Happy Wanderer” and we were very happy there indeed. 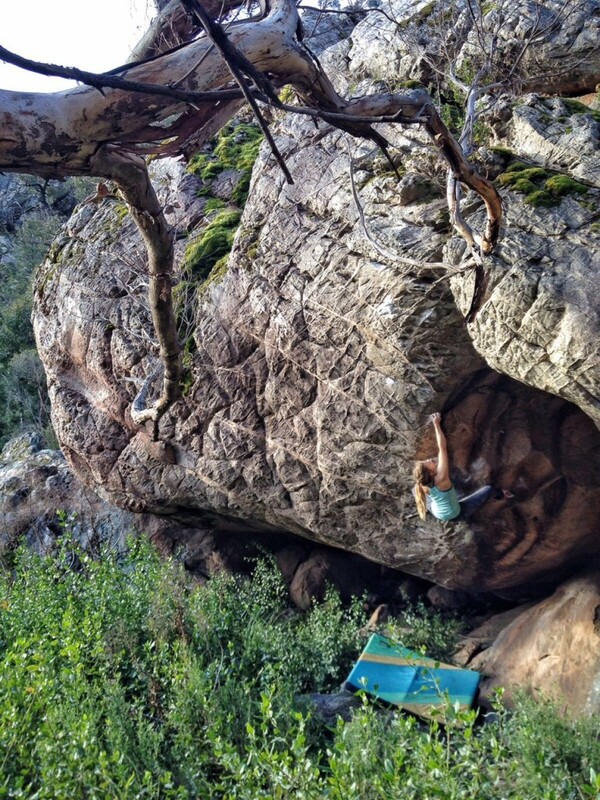 Nestled in the North Grampians, the infamous Taipan wall was in our stomping ground, as well as plenty of bouldering. 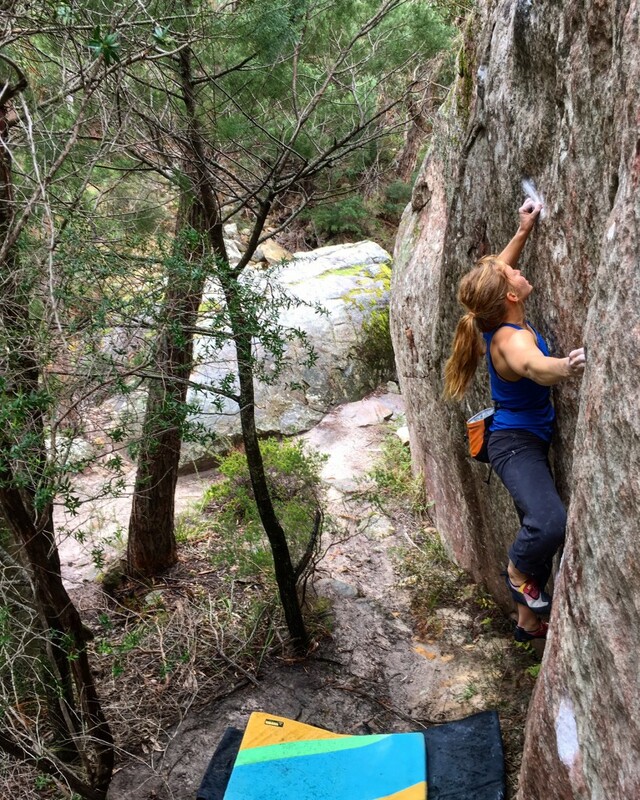 The South Grampians and Halls Gap bouldering wasn’t too far and Arapiles was a short day trip away (with the added luxury of some kind of Horsham-based café hit for cake). So we were set. 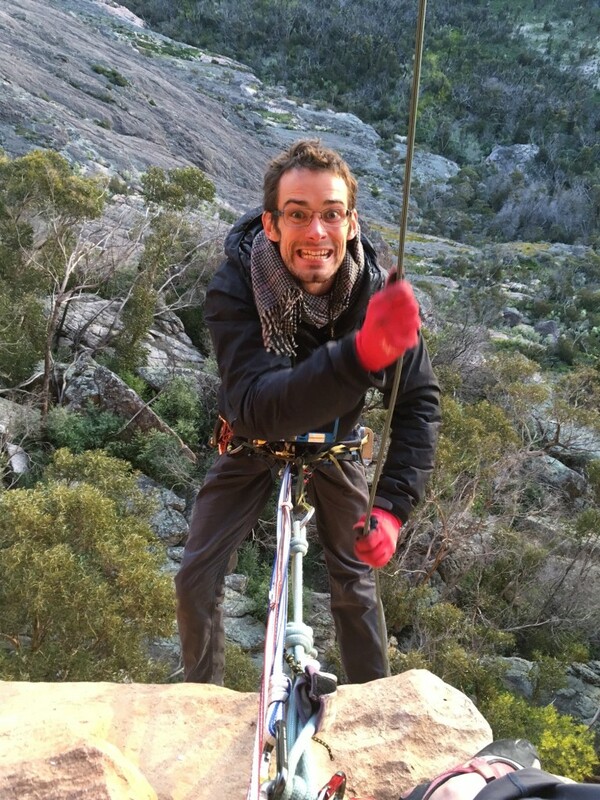 David was psyched for boulders of his dreams that have been on a mental (and probably written down, perhaps even on special paper) life tick list for eternity and I was frothing at the thought of trying historic, infamous routes like Punks in the Gym at Arapiles and Serpentine on Taipan Wall. I was psyched for bouldering too but, having spent the previous months training a lot of fitness, it would be an understatement to say I wasn’t sure how strong I would be in the pebble-hugging department. It felt like a bit of an unknown but I knew, thanks to an overwhelmingly boring amount of aerobic capacity training (thanks Barrows – I am grateful now, I promise), that I was relatively fit. So, early on in the trip I went to have a play on Punks in the Gym. At that point I was mid way through Andy Pollitt’s book, not quite at the Punks bit yet, fighting the urge to skip forwards and hear his take on the route and all the shenanigans that went with it…and “that hold”. Punks in the Gym, although bolted by Martin Scheel is a Wolfgang Gullich route. His first ascent put up what was then (in 1985) perhaps the hardest route in the world at grade 32/8b+. The “hold” in question has a blurry tale to it that varies depending on what you read and who you ask but essentially there was some breakage followed by re-building, resulting in a rather odd “birdbath” hold in the crux sequence that is quite out of character with the rest of the rock on the route. Some feel it ruins the climb, for me it told a story of human history on the rock. Yes, it is a bit ugly, but the rest of the route makes up for it with immaculate rock and funky, interesting movement. So, drawn in from the first session, this was to be my project for the trip. 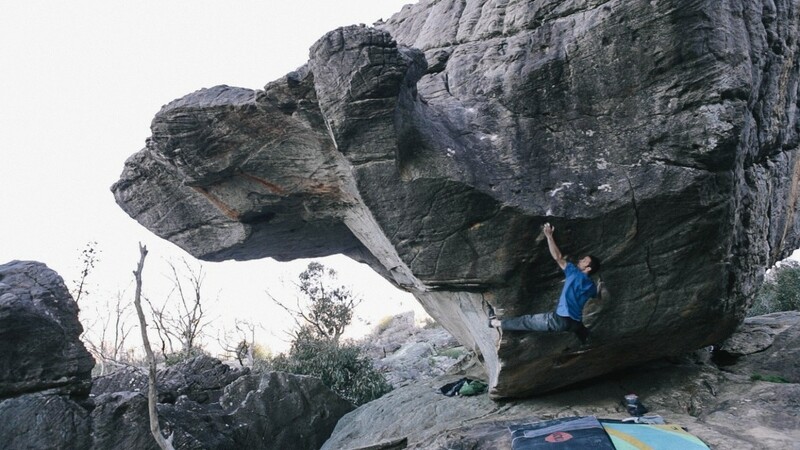 We actually struck a really nice balance, going to Arapiles twice a week for me to try Punks and bouldering the rest of the time. This system meant that David was my belay bunny on his rest days and it also meant that I bouldered quite a lot too, in fact surprising myself by getting up some relatively hard stuff. 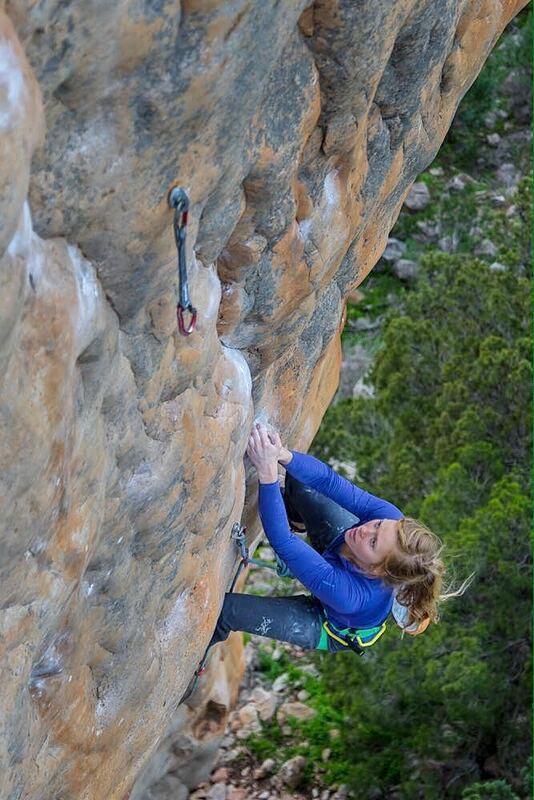 The weeks started to fly by and I got closer and closer, my seventh session spent falling repeatedly trying to get my foot in the birdbath hold (this was definitely the redpoint crux for me). I was beginning to worry that my focus on this route was going to cost me the chance of climbing on other things, going all the way to Australia and just projecting one thing. I’m sure many people have and will do that but I didn’t want to. I guess I’m greedy, I wanted Punks but I also wanted time to climb on other stuff too. Luckily, despite being a bundle of nerves (the kind you get when you know you can do something) on my eighth session, I tied in and climbed the route. Like often happens, it felt fine from what I can remember, which isn’t much. Those flow moments are what makes climbing so special. Though a seemingly nerve-wracked nutcase on the ground, as soon as I stepped on everything melted away and there was just movement, breath and rock. So psyched, definitely a lifetime tick that one. It seems Australia is full of lifetime must-dos (or at least must-trys!) 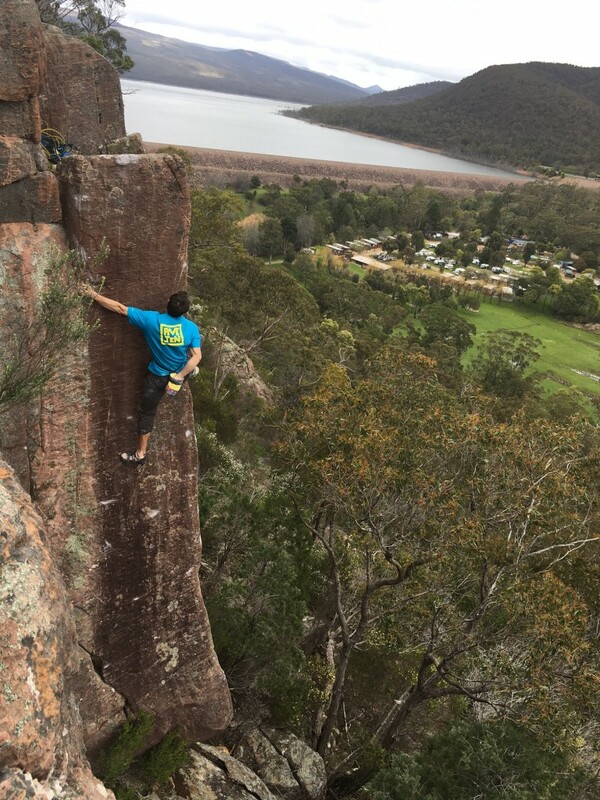 and very soon my route climbing based attention had shifted to the mighty Serpentine on Taipan Wall. Although Serpentine comes in at 29/8a, a good notch below Punks, the challenge was very evident in the nature of the climbing, the wall itself and everything that went with it. To the seasoned trad climbers among you it may seem like nothing extra but, for me, the exposure, the run outs, hanging belay and the mixed nature of the protection all added up to quite a mental challenge. I’ve never been fearless even on bolts, the fact that this route was a mixture of bolts and trad gear, along with some pretty hefty spaces between, gave me jelly legs. To my absolute delight, when we rocked up to try the route, it was already fully equipped. Wonderful. My nightmares of trying to fiddle in gear on unknown territory with serious space below my feet were quashed and I breathed a sigh of honest relief. My first session was brilliant; I loved it. I felt relatively fearless actually and did the route in sections to the top, basking in the sun on my way. Deciding to come back another day to finish it, I left on a total high. Funny how things shift! I’m gradually learning about fear and one of the things I have gathered over time (and was sternly reminded of here) is that when my body feels good and strong and fit I can surprise myself and be pretty bold. On the flip side, if I am tired, run down or just having a not so good day and don’t move well or trust my muscles to fire when instructed, I turn into to a scared little mouse. Seems obvious right?! Well, I felt like I was learning it for the first time on my second time up Serpentine. I hesitated, said, “take” all over the place and generally went up the route just to have a good old wobble. So much for going back to finish it off! I left it for the day, unsure which experience had been a true reflection of what was possible, the first day fearless Mina or the second day puddle-like version. Selfie at Serpentine belay ledge. After that I stalled going back to the route, I put it off a bit until I woke up feeling fresh and psyched to take it on. We went back and first go I managed to get through to the headwall only to mess up a sequence and pump out. I was ecstatic, my fearless self was back and even if I didn’t do it that day, I knew I had it in me. After a decent rest, at the end of the day I redpointed the route. It was perfect in some ways, the golden evening light on the headwall as I climbed and the sun began to set. I’d like to day I climbed it gracefully and flawlessly, and perhaps some sections I did, but the very last section gave me some jip. I messed up the foot moves and, with the top of the wall a single hand move away, I was forced to reverse some moves! I thought I’d blown it, but thanks to Barrows and his boring aerocap, I recovered and made it to the top. A spicy finish to a fantastic route, I sat on top and looked at the view. An amazing moment. Then I heard a tiny voice from below: “Well done!…..ummmmm my legs are numb, can you come down??”. 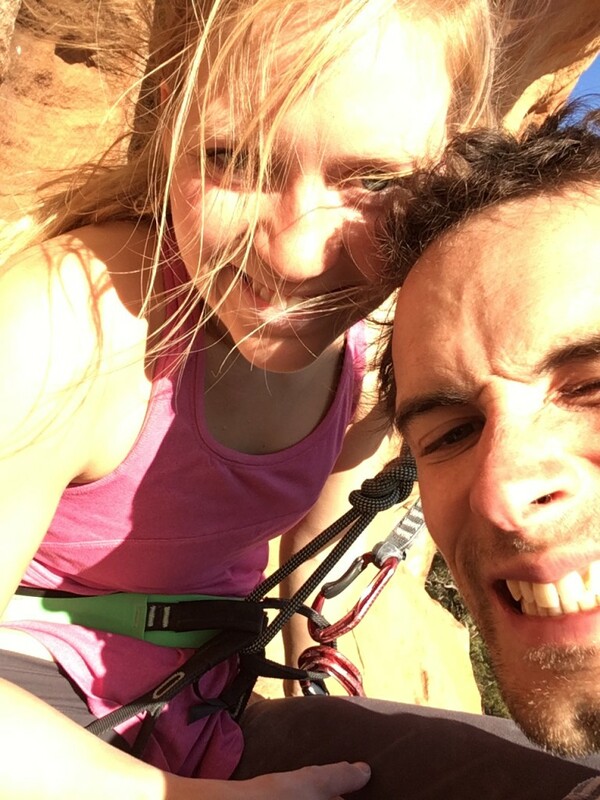 Massive thanks to David for belaying me, a hanging belay is not a boulderer’s first choice for a rest day I’m sure! Pizza and beer were quick to fix that, I know how to handle these things. So with my main goals achieved, I spent the remainder of the trip pretty chilled, doing other routes like the classic Eye of the Tiger (8a) and surprising myself with a flash of Monkey Puzzle (7c+) – I’m generally not great at flashing/onsighting so this was very nice. I really got the bug for bouldering back this trip too, I’m keen to work on getting more basic strength to progress again but was happy to bag a few 10s, 11s and a couple of 12s, including a last day send of Nalle’s Silver Platter – climbed in-between rain showers after sitting on a rope shielding the top holds from the rain while Dave told me I had lost my mind…definitely pays off to be keen! 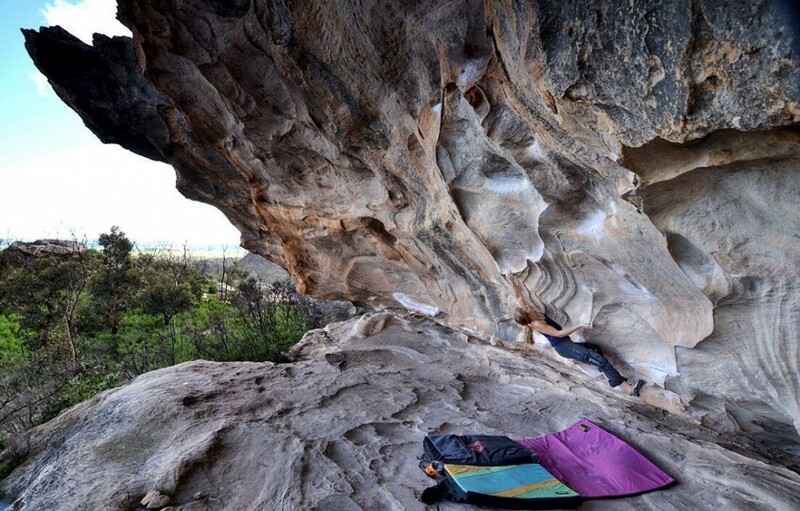 Gripmaster (V10), Photo David Mason. This one was really hard for me!! David crushing Ammagamma (v13). One of the biggies on the dream tick list. Brilliant that, well done Mina and David too on your successes. Funny, that description of Serpentine (bar any in-situ pro’) was Exactly the same as my experience! And the modern day ‘Birdbath’ has Nothing to do with me. Someone showed me a pic of it and it’s a disgrace. Really hope you enjoyed the book and thanks for the mention. Ah thanks Andy! Yeah, amazing place, we had such a blast. In New Zealand now climbing at Flock Hill which is mind bogglingly beautiful – have you climbed there at all? Really enjoyed the book, loved hearing tales of those days in Wales and Sheffield :). All the best, Mina. No, never been to NZ but my very close mate Charlie Creese hails from there and was instrumental in its early development. Shame you & David weren’t in Melbourne for long, would’ve been a pleasure to have coffees together. Anyway, keep it real and glad you enjoyed ‘Punk’.